The Castle was purchased as something of a ruin, for under £300, by the Menzies Clan Society in 1957 very much in faith and hope, for there was very little money or means to do anything with it. However, it was thought important for the newly resuscitated Clan Society to have this very appropriate historical base. Thus the members of the Clan Society have replaced the Menzies family and it is thought this is a unique situation for a clan castle and a very enviable one. Other clans have lost their castles to complete ruins or the old residences have been sold out of their clans to others and a few are still owned by their own Chiefs. Some have built modern centres for themselves as headquarters. Some roof repairs and some demolition of eastern outhouses took place during the first 14 years of ownership by the Clan Society. It was visited by members when on holiday and on the annual Clan Gathering day afternoon (not a weekend event then). This was due to the kindness of Mr William Hood (Willie) and his wife Mrs Mary Hood or Menzies in keeping the key and an eye on it from their home in the South Lodge and often in guiding people round the castle. It was not open to the general public as it was in far too dangerous a condition for that. It was not until 1971-2 that surveys were carried out which indicated that some much more active work would be required or the Castle would be lost. Plans were drawn up for the restoration of the oldest part, the sixteenth century Z-plan part, and appeals were put out for funds. A grant was obtained from the Historic Buildings Council for Scotland (now Historic Scotland) and work commenced in September 1972. This was an extremely significant piece of restoration and, not surprisingly, took many years. It was led by Dr A D Dewar (Bill) and his wife Ann, who spent a great deal of time and effort into researching what was needed, raising funds and often hard, physical graft in a very hands-on style. As things progressed it was, in an unofficial way, made open to the public. Mostly they had to be guided round as there were still dangerous areas. But this was the way forward – this way it might pay for its normal running costs. Although some contributions of money and physical help came from the Clan Society members and some local people, it was insufficient and much more of the work had to be grant-aided and it needed staff. The unoffical viewings continued until there was a house available for a permanent warden. This was completed out of the old western outbuildings in 1983 and the first Castle Warden was appointed. Nowadays this role has developed into our Castle Manager. The restoration of the Victorian (or West) wing began in 1990, this part of the building having been isolated up until then, to prevent spreading of rot. Again we were advised that action would need to take place as one part was in danger of collapse. A connecting passage between the sixteenth century Z-plan building and the Victorian wing had to be built so that access was restored, although only at ground level. This work allowed a tearoom to be opened on the ground floor and the first floor room, known as the ballroom, was fully restored. It has now been renamed the Dewar Room to mark the work done by Dr & Mrs Dewar. The first Menzies Clan Society dinner was held in this room in 1995 and it is largest and grandest of the rooms in the Castle. The Dewar Room is being increasingly hired out for weddings and other special celebrations and concerts. The second floor of the Victorian wing now houses the Menzies Clan Society's library, the Society's archive and a fine room which we currently call the Chief's Sitting Room which is used for Society and Trustees' meetings. There is still scope for further restoration of this floor and the second floor above. Born in Dover, England, on 30 March 1915, Bill Dewar was educated at Dover Grammar School and London University. He was the son of Alexander Dewar and Bertha Jane Mortby. Bill’s grandfather, Duncan Dewar, was born at Tullicro in Dull parish, Perthshire. His son Alexander, Bill’s father, “emigrated” to London and then to Dover, where Bill himself was born. 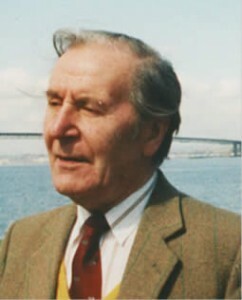 In 1948 Bill moved to Scotland, beginning his long association with the Department of Physiology within the Medical School at the University of Edinburgh. He became Senior Lecturer and later Research Fellow, retiring in 1985. His work highlighted the importance of the hormone progesterone in laying down fat stores during pregnancy, long before the problem of obesity in human pregnancy became current. Bill is remembered as an amiable colleague, full of good sense and an inspirational teacher to generation´s of students. In 1955 he married Ann Vallack Single, daughter of Dr Clive Single, DSO, and Mrs Verania Single (nee MacPhillamy), OBE, of Sydney, Australia. Ann qualified as a speech therapist in her native Australia and theirs was a long and very happy partnership, sadly broken by Ann’s death in 1999. Working together, they developed the Edinburgh Masker, an electronic device for suppressing stammering, which proved remarkably successful. Bill had a deep love of Scotland, its history and architecture, and these passions found full and practical outlet in his and Ann’s work to restore two significant Menzies buildings. Firstthey tackled the Old Kirk of Weem or Menzies Mausoleum, their efforts being internationally recognised by the award of a European Architectural Heritage Award in 1975. Bill then set his sights on a much larger and more challenging task, and one which was to consume most of his spare time and energy over the next forty or so years: Castle Menzies itself. The Menzies Clan Society acquired the castle in 1957 in a very derelict condition. Beginning in the late 1960s, Bill became involved with the Clan Society, helping them realise their dream to restore the castle from a virtual ruin. Under his supervision a bold strategy was put in place and, realising the enormity of the task, the work was phased and prioritised. Efforts to combat rot and achieve restoration were concentrated on the most significant 16th century wing. The less significant 18th century north wing, where dry rot was rampant, was to be demolished. The Victorian West Wing was to be isolated so as to contain the spread of rot, with restoration to be tackled when (and if) the work to the main castle was completed. Bill’s contribution to the castle was practical too, he and Ann carrying out much of the work themselves. Throughout this time Bill was also a mainstay of the Clan Society, being an office bearer for many years and also Editor and contributor to the magazine. The 40 years successful restoration of the whole castle was marked in 1997 when Bill received an MBE for services to conservation. The Clan Society and the Trust also expressed their gratitude by agreeing to name the Castle ballroom the Dewar Room in honour of Bill and Ann. He died in Edinburgh in December 2010.